May 20, 2015 – Astronomers are poring over newborn supernova measurements taken by NASA’s Kepler and Swift spacecraft in hopes of better understanding what sparks these world-shattering stellar explosions. 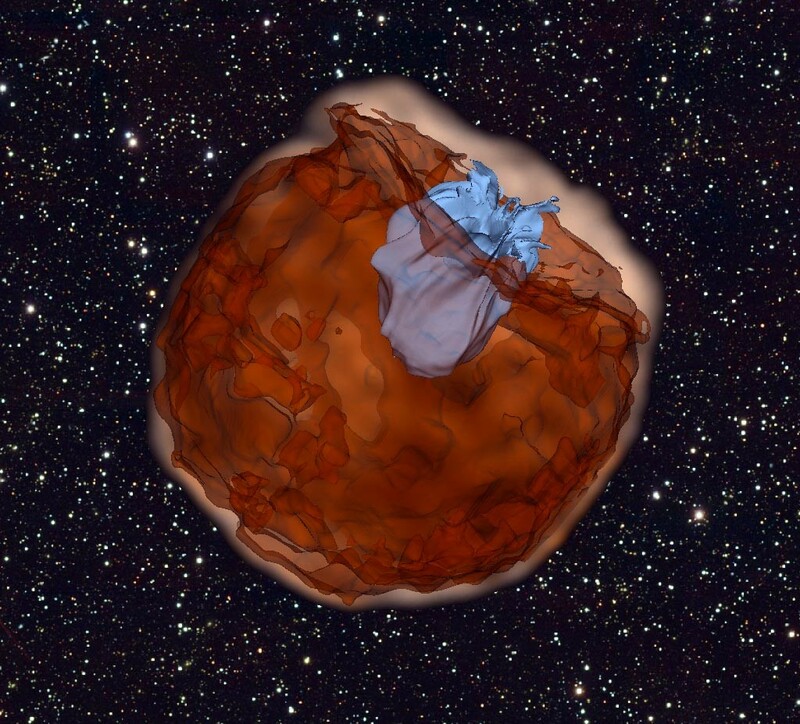 Scientists are particularly fascinated with Type la supernovae, as they can serve as a lighthouse for measuring the vast distances across space. Type Ia supernovae explode with similar brightness because the exploding object is always a white dwarf, the Earth-sized remnant of a star like the sun. A white dwarf can go supernova by merging with another white dwarf or by pulling too much matter from a nearby companion star, causing a thermonuclear reaction and blowing itself to smithereens. In studies appearing in Nature on Thursday, Kepler and Swift have found supporting evidence for both star-pulverizing scenarios. 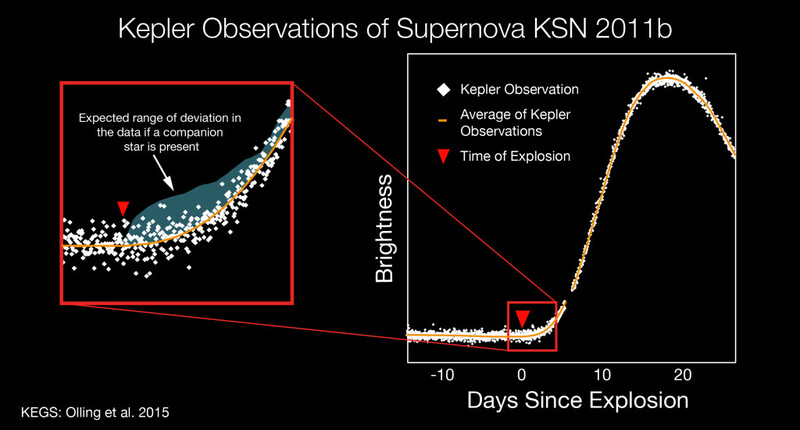 Researchers studying the Kepler data have caught three new and distant supernovae, and the dataset includes measurements taken before the violent explosions even happened. Known for its planet-hunting prowess and its unceasing gaze, the Kepler space telescope’s exquisitely precise and frequent observations every 30 minutes have allowed astronomers to turn back the clock and dissect the initial moments of a supernova. The finding provides the first direct measurements capable of informing scientists of the cause of the blast. To capture the earliest moments of Type Ia explosions, the research team monitored 400 galaxies for two years using Kepler. The team discovered three events, designated KSN 2011b, KSN 2011c and KSN 2012a, with measurements taken before, during and after the explosions. These early data provide a view into the physical processes that ignite these stellar bombs hundreds of millions of light years away. When a star goes supernova, the explosive burst of energy ejects the star’s material at hypersonic velocity, emitting a shock wave in all directions. If a companion star is in the neighborhood, the disruption in the shock wave will be recorded in the data. Scientists found no evidence of a companion star and concluded the cause to be the collision and merger of two closely orbiting stars, most likely two white dwarfs. Knowing the distance to a galaxy in the Kepler survey was key to characterizing the Type of supernova uncovered by Olling and his colleagues. To determine the distance, the team turned to the powerful telescopes at the Gemini and the W. M. Keck Observatories atop Mauna Kea in Hawaii. These measurements were key for the researchers to conclude that the supernovae they had discovered were that of the Type Ia lighthouse variety. A separate group of astronomers have also found intriguing data on a different supernova. Led by California Institute of Technology (Caltech) graduate student Yi Cao, a team using Swift has detected an unprecedented flash of ultraviolet (UV) light in the first few days of a Type Ia supernova. Based on computer simulations of supernovae exploding in binary star systems, the researchers think the UV pulse was emitted when the supernova’s blast wave slammed into and engulfed a nearby companion star. According to the analysis, the supernova debris slammed into and swept around its companion star, creating a region of UV emission. The peak temperature exceeded 19,000 degrees Fahrenheit (11,000 degrees Celsius) or about twice the surface temperature of the sun. The explosion, designated iPTF14atg, was first seen on May 3, 2014, in the galaxy IC 831, located about 300 million light-years away in the constellation Coma Berenices. It was discovered through a wide-field robotic observing system known as the intermediate Palomar Transient Factory (iPTF), a multi-institute collaboration led by the Caltech Optical Observatories in California. The team immediately requested follow-up observations from other facilities, including ultraviolet and X-ray observations from NASA’s Swift satellite. Although no X-rays were found, a fading spike of UV light was caught by Swift’s Ultraviolet/Optical Telescope within a few days of the explosion, with no corresponding spike at visible wavelengths. After the flash faded, both UV and visible wavelengths rose together as the supernova brightened. The UV pulse from iPTF14atg provides strong evidence for the presence of a companion star, but as white dwarfs crashing into each other can also produce supernovae, as demonstrated by the Kepler results, astronomers are working to determine the percentage of supernovae produced by each one. The scientists add that a better understanding of the differences among Type Ia explosions will help astronomers improve their knowledge of dark energy, a mysterious force that appears to be accelerating cosmic expansion. Swift blasted into orbit November 20, 2004. Managed by Goddard, the mission is operated in collaboration with Penn State University in University Park, Pennsylvania, the Los Alamos National Laboratory in New Mexico and Orbital Sciences Corp. in Dulles, Virginia. Other partners include the University of Leicester and Mullard Space Science Laboratory in the United Kingdom, Brera Observatory and the Italian Space Agency in Italy, with additional collaborators in Germany and Japan.